I’m in the midst of an heraldic hunt, albeit a sporadic one as other projects vie for my time and attention. I’m trying to find Sir Edmund Turnor, Knight. And why am I looking for him? Because I have his window. Well, to be more precise, I have a window with his arms. It was a gift to me several years ago from my wife, who saw it in an antique store and knew that I would be thrilled to receive it. As I was. But, having been gifted with the window of his arms, as time and resources permit, been on a hunt for the armiger behind the arms. With, so far, less than complete success. The arms of Turnor were easy enough to trace. Burke’s General Armory notes the arms of Turnor of Stoke Rochford, co. Lincoln, "descended from Christopher Turnor, temp. Henry VIII, a member of the family of Turnour, of Haverhill", and specifically notes two sons, Sir Christopher Turnor and Sir Edmund Turnor. Burke gives the arms of this family as Ermines on a cross quarter-pierced argent four fers-de-moline sable. The difficulty comes in the form of the cadency mark in the arms on the window: an annulet, the mark of a fifth son. While I have been able to find a Sir Edmund Turnor (b. 1619; knighted 1663; d. 1707) in the Dictionary of National Biography who seems a likely candidate for "my" Edmund Turnor, I have to date only found three older brothers for him (Christopher [died aged 4 days], Christopher, and Thomas), which would have made him the fourth son (who should bear a martlet as a difference), not the fifth son. 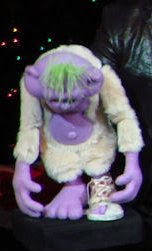 * Leaving me to say, as Jeff Dunham's puppet Peanut does while placing his head facing down, "Damn." So as my time permits, the search continues. 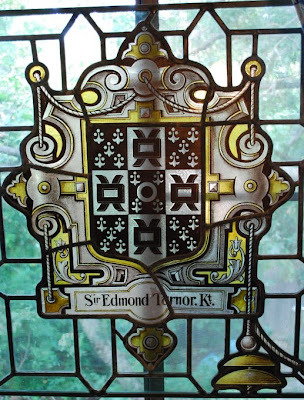 Did the Sir Edmund Turnor I found in the DNB have another, even more obscure, older brother? Or am I looking for another, entirely different, Edmund Turnor? At this point, I do not know. But I do know that I am enjoying the hunt, and hope someday to have some solid information about the life and times of the man whose armorial window has a prominent place in my own window. * Indeed, it is entirely possible that, under the English rules of cadency, that the first Christopher, having died when only four days old, would not really count, making this Edmund effectively a third son, whose difference is a mullet. Which would mean that for this Edmund to be "my" Edmund, he needs to have had not one but two more older brothers. Found your blog while searching for something quite different. Ijust wondered if the item itself is a clue. Can its origin be traced through the shop where it was purchased? An expert isnglasswork may be able to say something about the maker of the window, and this may lead to some information as to the location it was commissioned for. This might narrow down/confirm which Turner family is the right one. I have tried that route, and drawn a complete blank. The antique store from which it was purchased obtained it simply as a "filler" piece that was included with a load of furniture from England. When I had the window repaired (there was a cracked piece, and the whole window was in need of reframing), the glassworker (who seemed very knowledgeable) was only able to tell me that the separate pieces of the window had been "signed" with the initials of the maker, which he found to be very unusual; most of the stained glass windows he'd seen were unmarked that way. But he could not tell me anything about who the artist may have been based only on the initials. I still have some hopes of "reverse tracing" it; if I can determine the right family Turnor from genealogical records, etc., I may be able to find where the window was originally installed, and trace the stained glass workers/artists from that. David, These arms with the field blazoned as ermine rather than ermines, including the annulet for difference, were confirmed at the 1634 visitation of Bedfordshire to Christopher Turner of Bedford town. The pedigree is full of Christophers. I suspect the omission of the "s" in the blazon is an editing error.